Not to be confused with Burial at sea or Stone ship. Nabberör near Nabbelund, Öland, a ship burial from the Vendel Period with four skeletons, formerly covered by a cairn and now heavily damaged. Port an Eilean Mhòir – The only Viking burial yet discovered in mainland Britain, the mound was found in 2006 and excavated in 2011. 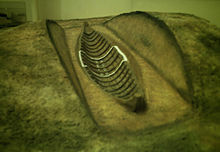 The Scar boat burial – a Viking burial found on Sanday, one of the Orkney Islands. ^ Ibn Fadlan and the Land of Darkness: Arab Travellers in the Far North (Penguin Classics 2012, ISBN 9780140455076), Introduction by Paul Lunde and Caroline Stone, pp. xxiii–xxiv. ^ Larsson, Gunilla (2007). Ship and society: maritime ideology in Late Iron Age Sweden. Uppsala Universitet, Department of Archaeology and Ancient History. p. 415. ISBN 9789150619157. ^ Incorporated, Walter De Gruyter (2002). Naualia – Ãstfold. Walter de Gruyter. p. 595. ISBN 9783110903515. ^ Strömberg, Märta (1961). Untersuchungen zur jüngeren Eisenzeit in Schonen: Textband. Mit einem Beitrag von J. Lepiksaar. R. Habelt. ^ Mikroficheupplaga av Tillväxten. Kungl. Vitterhets, historie och antikvitets akademien. 1946. p. xcix. ^ "Viking boat burial site discovered in Scottish Highlands". Channel 4 News. Retrieved 2011-10-19.